Suzana Vukic is the columnist of the Hudson/St.Lazare Gazette and member of the International Expert Team of the Institute for Research of Genocide, Canada. When recently asked my opinion on the upcoming provincial elections in light of my recent trip to Bosnia, all I could do was voice my disdain. We ended the Srebrenica Peace March on July 10 by arriving at the entrance of the Srebrenica-Potocari Memorial Complex and Cemetery. This is now the resting place for 5,657 of the Bosniak men killed by Bosnian Serb forces led by Ratko Mladic (currently on trial for war crimes at The Hague) 17 years ago, after they captured the “UN-protected” enclave of Srebrenica. It felt eerie to be at this place after experiencing the Peace March, where such a positive spirit of friendship and compassion prevailed. Nothing could prepare me for the stark reality of the evil that prevailed 17 years ago – the sight of all the slender, tall white tombstones, and the knowledge of what this represented: 8,372 men and boys killed within the space of a few days in July 1995, simply because of the their Bosniak (Bosnian Muslim) ethnicity. In passing the far end of the complex by car, I observed the endless row of coffins covered in dark green cloth, with a protective tarp of the same colour covering the entire length and width of that space. This visual image gives one a true sense of the horror of having 520 coffins in one place, in one day. The following day – on July 11, at the memorial complex – family and relatives of the deceased were there to prepare for their burial. It’s hard to imagine what they’ve gone through over the years, to know that their husbands, fathers, sons and brothers were most likely killed, but having to live with the uncertainty. That is, up until the day when they received news of their loved one(s) being found and unearthed, and their identities confirmed by DNA analysis. This news puts an end to any hope forever, but also brings closure. 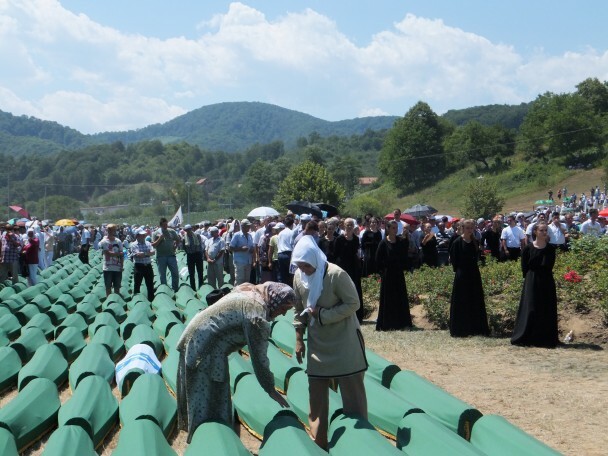 When the time came for the burial, it was difficult not to get emotional upon hearing the screams and cries of countless mothers, wives, sisters and daughters saying their final goodbyes. After 17 years. The entire place was packed with thousands of people, including dignitaries from all over the world who were there to pay their respects. Where were they all 17 years ago, I wonder? But then I remember: the world was there, in Srebrenica, represented by the Dutch Battalion troops serving the United Nations. This made no difference: these men were taken away right in front of UN troops, and then killed. Two days later, on July 13, I took a different journey with a small number of people. I accompanied the Mothers of Srebrenica to the region surrounding Srebrenica. We went to various sites where Serb forces held their Bosniak victims captive, as well as sites where these victims were murdered en masse. Family members of the victims laid wreaths at the sites where atrocities had occurred against their loved ones. Refija Smajlovic explained how the bodies of her father and paternal uncle were found in one bag. Her brother’s body was found in another. An elderly woman, whose husband and little boy were killed, took a bag out of her purse and showed me all of the medication that she must take in order to carry on.